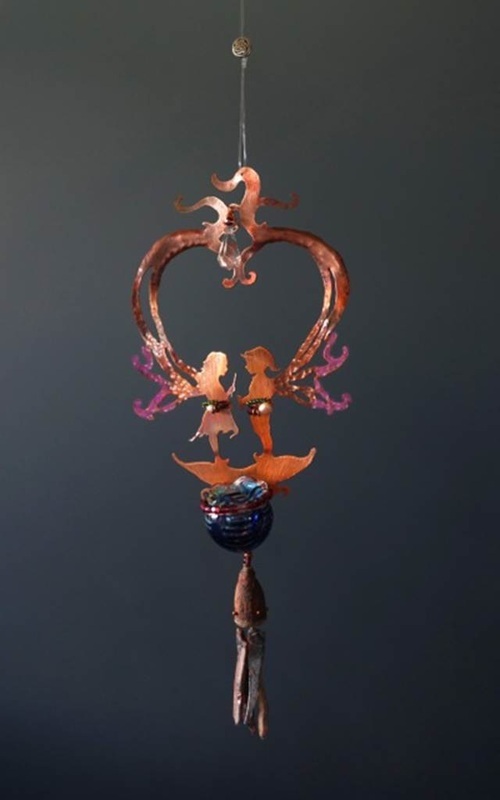 "I have been working under the name Fantasy Lane Copper Fairies since 1994, designing, creating, and finishing copper sculptures that are whimsical accents to the home and garden. 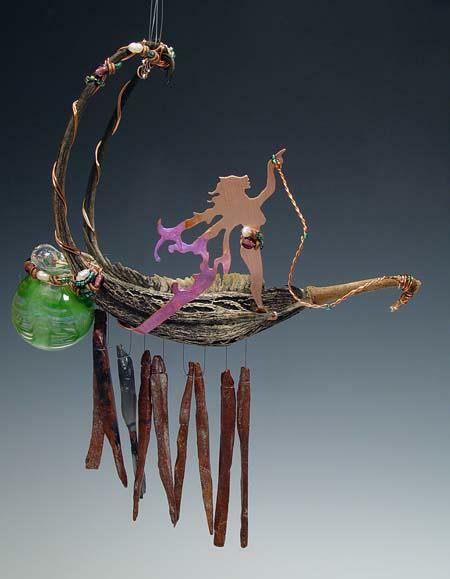 My work is based on nature, including plants & the spirit of fairies. 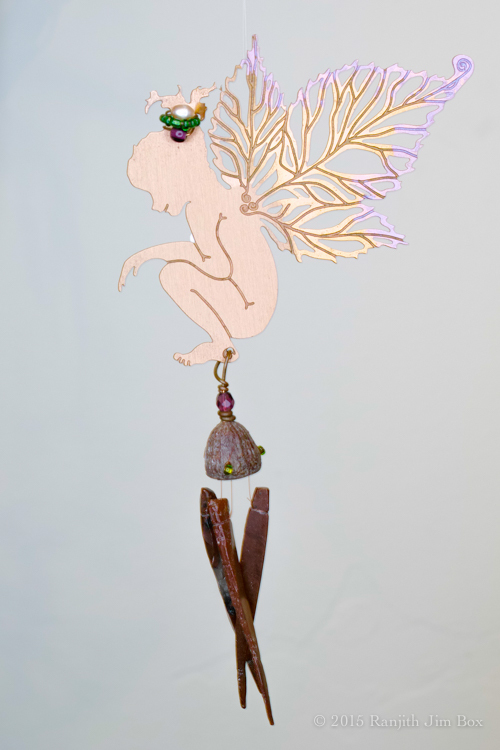 Many of my fairy creations are designed to teach their owners about the healing, restorative, and medicinal powers of the herbs after which the fairies wings are shaped. 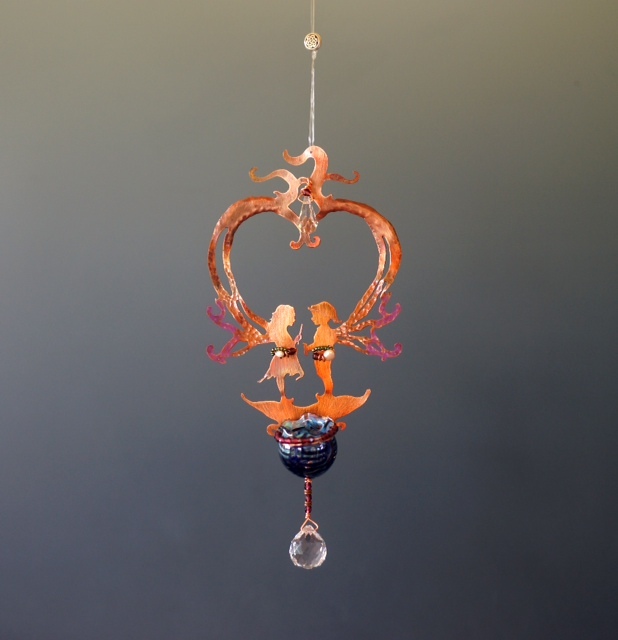 Each fairy is sold with a story book describing the fairy lore. 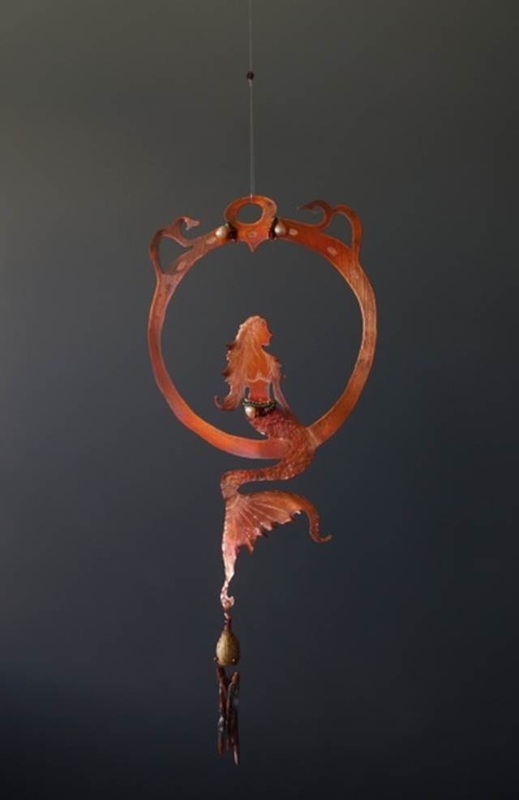 Many of my pieces include Obsidian wind chimes made exclusively by my friends and fellow artists, Deborah & Richard Bloom, of Portland, Oregon. 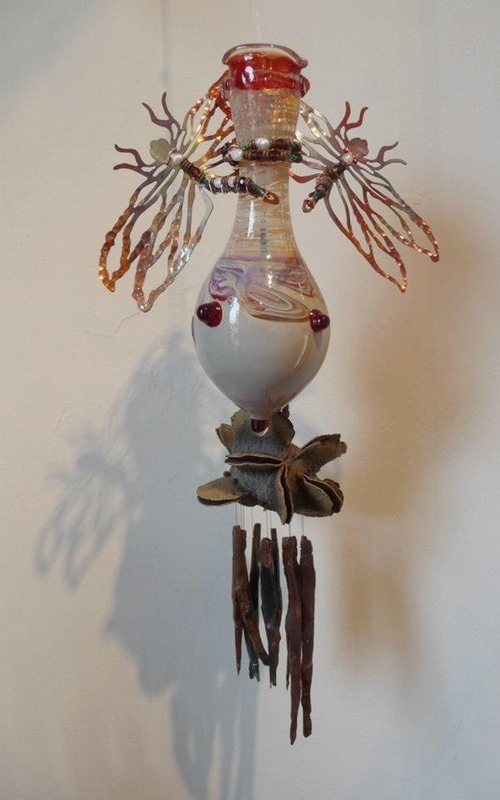 Many of my pieces also have blown glass talisman bottles made by my good friends and local artists David Stratton of Trinidad and Daniel Levinson of Arcata, CA. 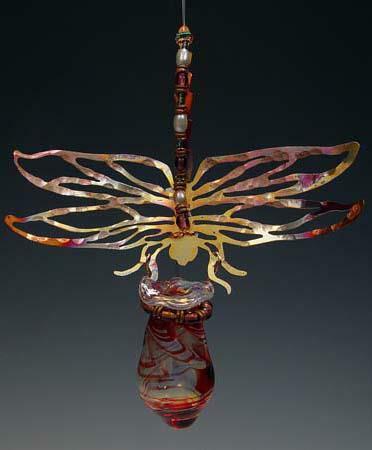 These can hold flowers, essential oils, love notes or any special treasure. 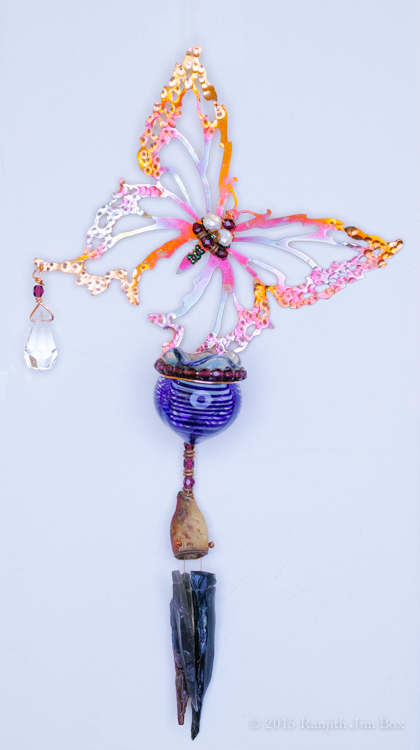 "I began to work in metals, glass, paper, leather and bookbinding after my father challenged me, at age 13, to make a better headdress than the one I had asked him to buy for me. 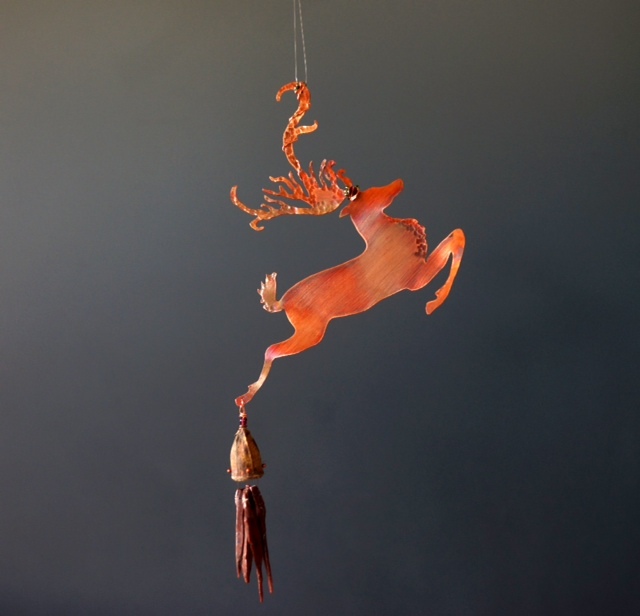 At 18, I left Palo Alto for Humboldt County, where I studied for 6 years at Humboldt State University with David LaPlantz, with an emphasis on jewelry & metalsmithing. 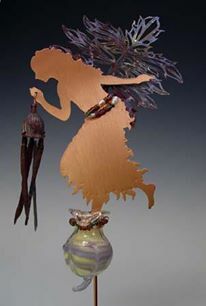 I took classes at Mendocino Art Center, in metal arts, becoming proficient in metal techniques such as casting, raising, chasing, torch enameling, fold-forming, and stone-setting. 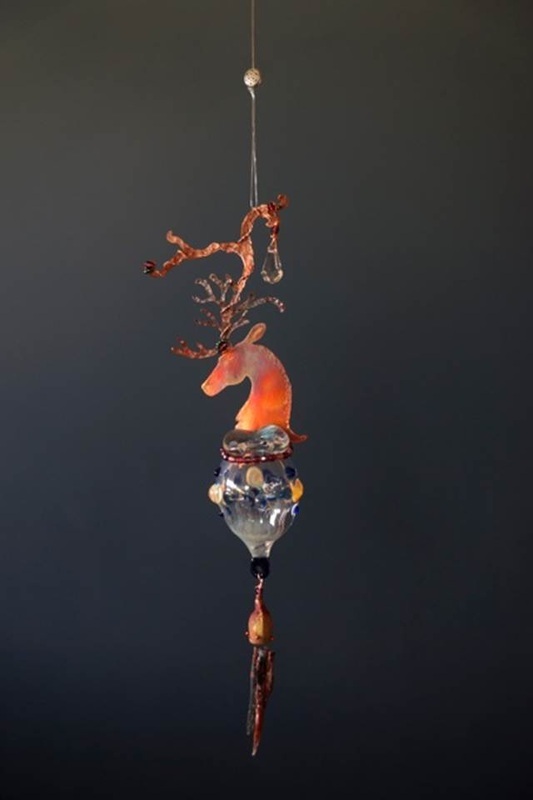 "After graduating from HSU in Art Education, I began to sell my work at large shows including The Northern California Renaissance Fair, Bumbershoot, Oregon Country Fair and the Original Great Dickens Christmas Fair in San Francisco. "I live in northern California with my husband and our son. My horse, Gamma, and I grew up together and have been friends for 30 years. I have had her since she was a baby. My horse is truly the source of my creative inspiration. She carries me into the forest and together we explore as my creative cup grows full. I feel blessed to live here in this paradise and to be a part of the Trinidad Art Gallery.